If you are reading this, it is most likely because you or someone close to you has lost a baby, if this is this case I am so sorry this has happened to you. My name is Carla Young, I ﬁrst contacted Dumfries and Galloway Sands in 2015 after our baby boy was stillborn at 27 weeks. 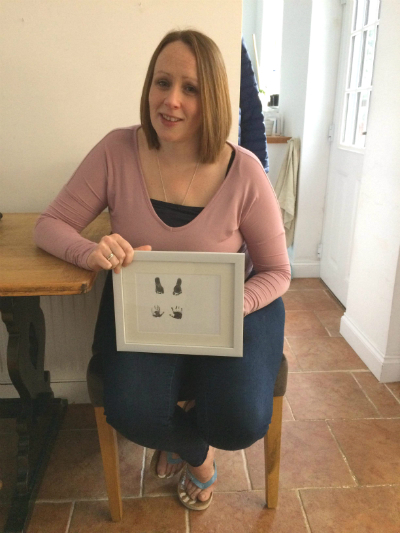 You ﬂeetingly hear the words stillbirth and barely register the statistics during pregnancy, you certainly never think it will happen to you and when it does nothing can prepare you for the utter devastation of losing a baby. It can be incredibly isolating, and I know I felt like I was the only person in the world this happened to. I still to this day can’t believe I contacted Sands, it was with no expectations and so out of character for me! But I am so glad I did, what I found was people who really truly understood what it feels like to have a baby die, and that was immeasurable. I received a lot of support from the befrienders at D&G Sands both after the death of our baby and during our subsequent pregnancy. I will always remain grateful to them both for the hard work they do and in ensuring the opportunities given to us after our baby died. But I am also so glad they were there when I needed them.